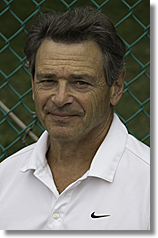 For the fifth time, Tennis Resorts Online contributor E.J. “Terry” Kahn III is headed to the John Newcombe Tennis Ranch in New Braunfels, TX for their annual Fantasy Tennis Camp. As usual, the men’s-only event will have a lengthy roster of “Legends” in attendance, John Newcombe himself obviously among them. But among the returning coaches in this year’s field is 12-time Grand Slam champion Rod Laver, back for the third time. That alone pretty much guarantees that this will be another memorable gathering. Fortunately we will have Kahn, a dogged lefty, there to chronicle everything that goes on, from the on-court battles to the off-court shenanigans and the camaraderie in between. The fun begins.